Fresh decals set by <<Barracuda Studios>> was released recently. This sheet features 7 interesting Gustavs with a wide array of colors and markings. Thoroughly researched by Anders Hjortsberg, who also created the stunning profile artwork, these are the culmination of years of research, and represent the latest thinking in color and markings. 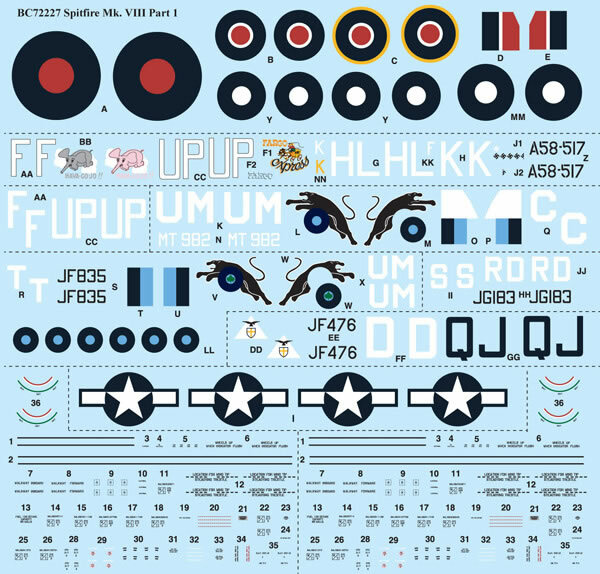 This sheet features full color instructions, 2 full sets of stencils and enough national markings to do at least 2 aircraft. Bf 109G-6. Black 10 of IV./JG54, Dorpat, Russia, early 1944. 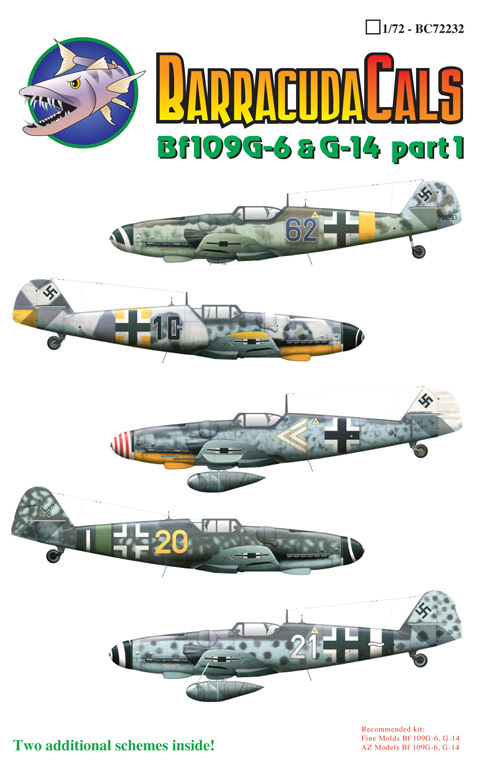 Bf 109G-6. 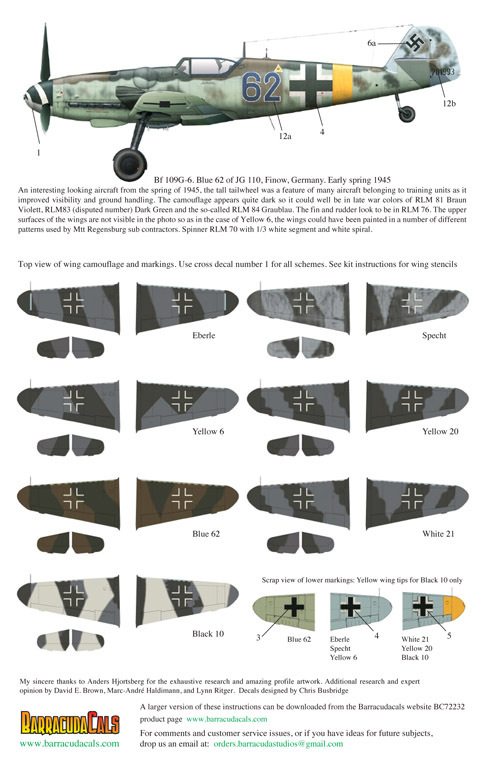 Yellow 6, of 9./JG3, Normandy, July 1944 Bf 109G-14. White 21 of Franz Wienhusen, Gruppenkommandeur IV./JG4, autumn 1944. 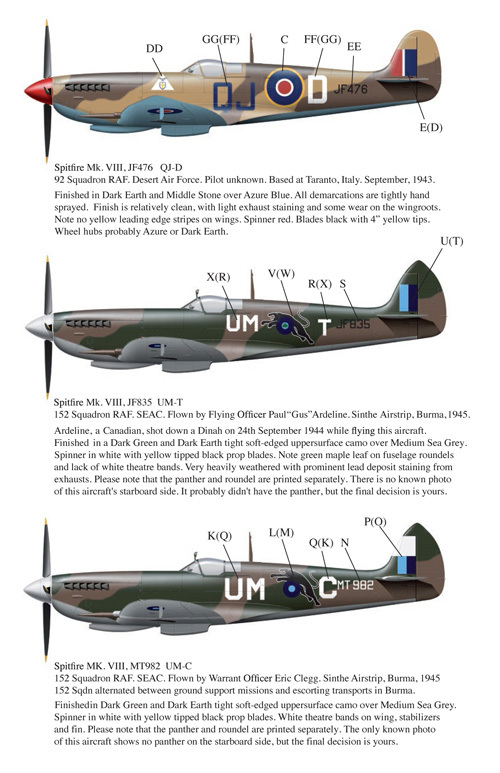 This sheet contains markings for 6 different Spitfires operated by different air forces in 23 theatres. 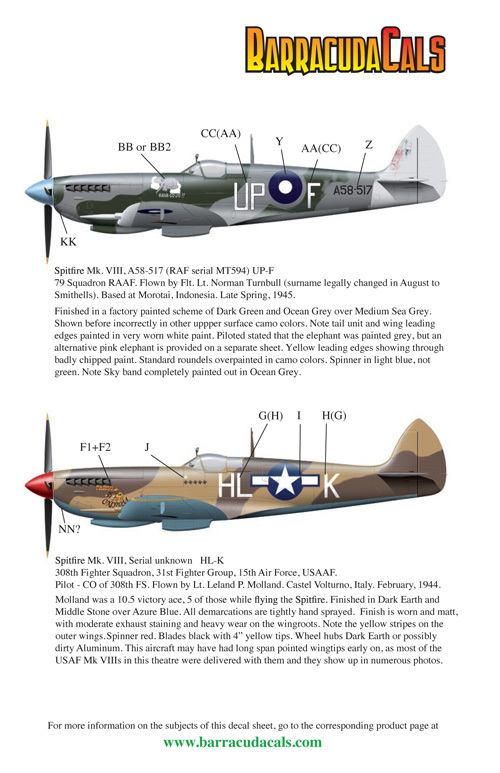 The sheet is thoroughly researched and beautifully printed by Cartograf. 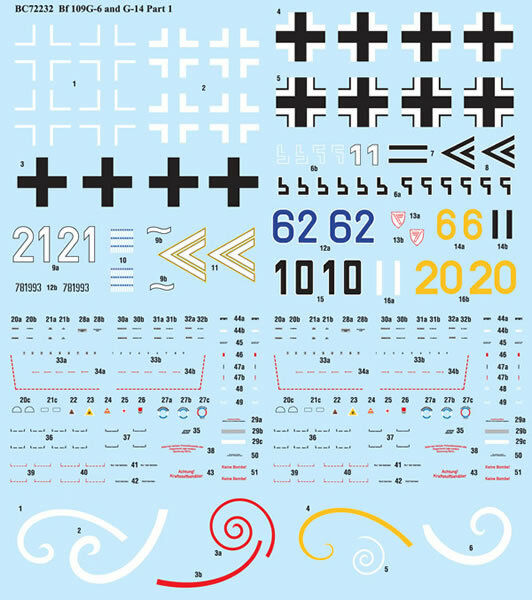 Complete with 2 full sets of stencils including door stencils and bomb markings and full color instructions. Spitfire Mk. VIII, Serial JF349 HL-K 308th Fighter Squadron, 31st Fighter Group, 15th Air Force, USAAF. Pilot - CO of 308th FS. Flown by Lt. Leland P. Molland. Castel Volturno, Italy. February, 1944. Spitfire Mk. VIII, A58-517 (RAF serial MT594) UP-F 79 Squadron RAAF. Flown by Flt. Lt. Norman Turnbull (surname legally changed in August to Smithells). Based at Morotai, Indonesia. Late Spring, 1945. 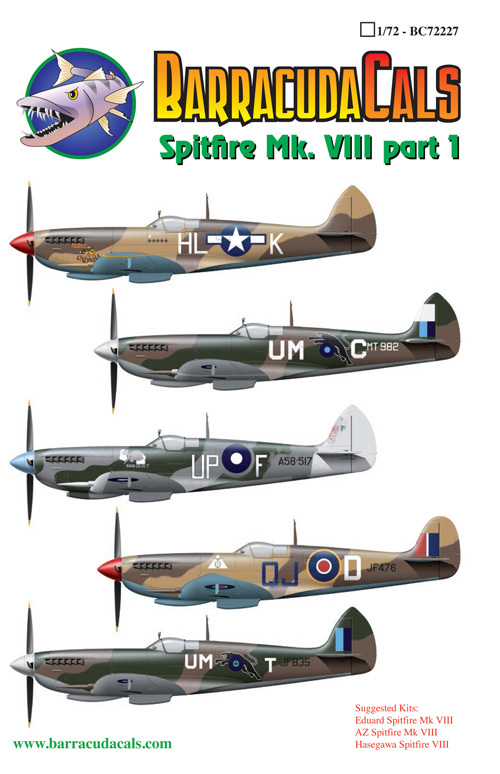 Spitfire Mk. VIII, JF476 QJ-D 92 Squadron RAF. Desert Air Force. Pilot unknown. Based at Taranto, Italy. September, 1943. The good news? More to come from Barracuda! I'd love to do the Erla decals in 72nd scale, but there is no mainstream kit available of the Erla built 109G-10. When there is, we will certainly be looking at releasing the sheets.